Koda | Greenpath Electric Bikes | Electric Bikes For Sale in NYC and Brooklyn, NY. Free Delivery in the US! Motor: 500 Watt Rear Hub. Battery: 48 Volt, 11 Ah Mounted In Downtube. Colors: Titanium Gray, Pearl White. Features: High Performance Street Bike, Plush Saddle, Adjustable Stem, Fully Featured Including, Fenders, Lights, Rear Rack, Disc Brakes, Front Suspension Fork, Affordable Price. 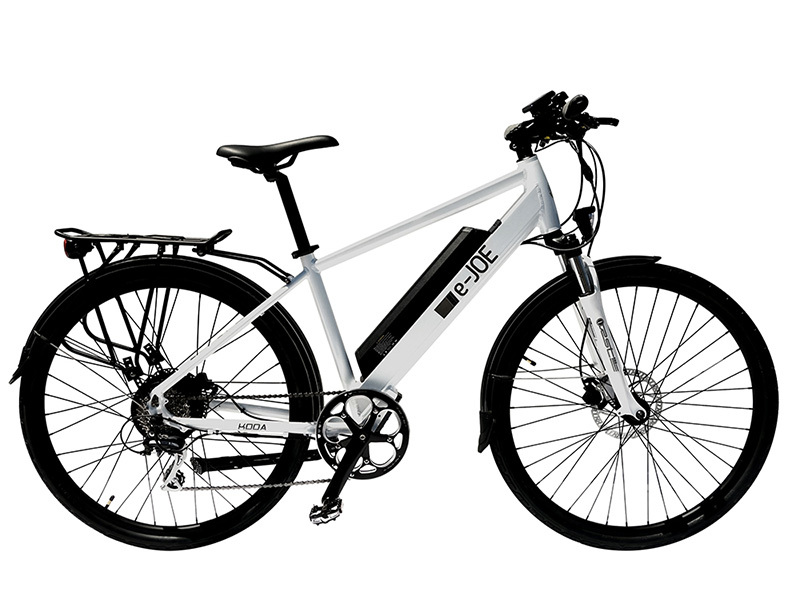 A well priced urban-commuter style electric bike that offers lots of useful accessories including fenders, carry rack and LED lights. Purpose built frame is light weight and well balanced thanks to a downtube mounted battery pack, professional color scheme. Only comes in high-step sized medium frame, no bottle cage mounts, fixed display panel, decent one year comprehensive warranty.